One of the most unusual churches in the world is right here in San Francisco – St. Gregory of Nyssa Episcopal Church. Along with an unusual layout and a plethora of Coptic Orthodox banners and art, it features the dancing saints’ icons. In a large circle above the communion table are icons of saints painted on the wall, including jazz artist John Coltrane and Donaldina Cameron of the Presbyterian mission, Cameron House in Chinatown. All of them are dancing. Featured prominently, larger than all the rest, is Jesus, leading them all in the dance. That icon is featured on the cover of our bulletin this morning. When it comes time for the eucharist in worship, the congregation rises from their seats at the other end of the sanctuary and dances to and around the communion table. I’ve thought about doing that here but the plagiarism would be too obvious. They thought of it first. I like the idea of a Dancing Jesus. Not because I am particularly adept at dancing myself. I’m a klutz. I really do feel awkward, self-conscious when I dance. My arms and legs don’t move easily. I suppose that’s due to the fact that I didn’t dance in my youth. I was a Baptist, after all. More about that later. But I do like a Dancing Jesus, especially metaphorically. Jesus danced for the people, for the disciples, for the religious rulers. Some followed, some rejected, some tried to kill him. But he danced, nimbly and with much grace. Our gospel story today, I believe, is one such example his dancing prowess, one in which he almost met his demise. Let us pick up the story from where we left off last Sunday. As we noted last week Jesus returned to his home town of Nazareth where he made the politically explosive proclamation about his ministry and message. The word about Jesus spreads throughout the countryside. Everyone praises his teachings. His reputation grows. The people are truly amazed at the “gracious words that came from his mouth” as Luke puts it. But not everyone. There are detractors and naysayers. It’s all about honor or lack of it. It’s what Jesus says next that actually gets him in trouble. He reminds them of the ancient stories of Elijah getting help from the widow of Sidon and Elisha healing only Naaman, the Syrian, of leprosy. He has crossed the line and they are offended. You see, the widow of Sidon and Naaman, the Syrian, were not of the household of Israel; they were gentiles. The gospel writer Luke has set up a crucial turning point in the story of Jesus. Jesus’ own people might not accept his message but the gentiles will. Luke goes on from here through the rest of the gospel and into the book of Acts to tell the story of how Jesus’ message goes to the gentiles. It turns out that Jesus’ politically explosive message is also an inclusive message for all to hear, not just the people of Israel. Obviously, Jesus’ message was not just geared to his fellow constituents, but was one that reached across the aisle in a truly bi-partisan spirit. His fellow constituents did not like it, not one bit. They could not tolerate an inclusive Jesus. He had to be dealt with. Just trying to ruin his reputation was inadequate. No. He had to be done away with. As Luke describes it, they drive him out of town to the edge of a cliff with the intent to throw him off the cliff to his death. So what does Jesus do? He dances! Well, OK, it doesn’t say that. It says “he passed through the midst of them and went on his way.” But I like to think that Jesus danced through the midst of them. Not danced around them, as in dancing around the issues. But danced right through them. In a bit here we are going to sing I Danced in the Morning written by Sydney Carter. 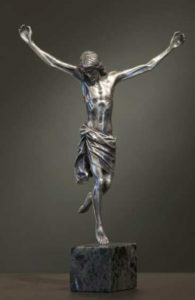 It describes how Jesus danced the gospel, all the way to the cross. It tells how he danced for the scribe and Pharisee, but they would not dance with him. Here in Nazareth we have the home folk refusing to dance as well. But even though his dance takes him to that dark Friday they could not keep him down. They cut him down but he leapt up high because he is the dance and he still goes on. But the song is not just about Jesus’ dance. It is, indeed, an invitation for us all to dance. Jesus leads us in the dance of the gospel, in the dance of peace and justice, in the dance of life. Dance, then, if we dare. In the Middle Ages, a thousand years later, church leaders were still railing against ecstatic and “lascivious” behavior at Christian services. And yet, priests danced; women danced; whole congregations joined in. Despite the efforts of the Church hierarchy, it could be said that Christianity was a danced religion. In the twelfth and thirteenth centuries, Church leaders finally purged the churches of this unruly and ecstatic behavior. But they must have known that they couldn’t eliminate dancing. So a compromise was made. The people could dance on Christian holidays, such as saints’ feast day, but not in church; they would have to take it outside. In so doing, it appears, the Church inadvertently invented carnival. Think Mardi Gras. Protestantism, particularly Calvinism, continued the message to the people that dancing was not good for their souls. Indeed, that festivities were positively sinful, along with the idleness that such frivolity encouraged. In England, May Day festivities, including maypole dancing, were ultimately declared illegal. But, as I said earlier, I didn’t. Dancing could too easily lead into all kinds of more serious offenses. As a result, sadly, I never went to a dance all through high school. To my ardent Baptist religion, dancing was a distraction to true faith; it was the devil’s snare. But I’ve learned better. Does that mean we’ll soon be dancing around the communion table? That’s a whole other discussion. So, I return to dance as metaphor. Are we ready and able to dance with Jesus? Well, in this metaphorical spiritual dance we are exploring today, Jesus brings it. It is his dance. He is the Lord of the Dance, actually (and not Michael Flatley). Sydney Carter, an English songwriter, wrote I Danced in the Morning in 1963. It’s based on the Shaker tune “Simple Gifts.” In writing the lyrics, Carter says the audacity of Jesus’ life and ministry inspired him. A little statue on his desk also inspired him. It was the Hindu God Shiva in a dancing pose. He says he really didn’t think it would become as popular as it did. First, there is that dancing phobia that reflects much of Christianity. But also, it is sort of a heretical view of Jesus. “Anyway,” he says, “it’s the sort of Christianity I believe in.” Well, it’s the sort of Christianity I believe in as well. Jesus invites us to join the dance. He invites us to live the dance.